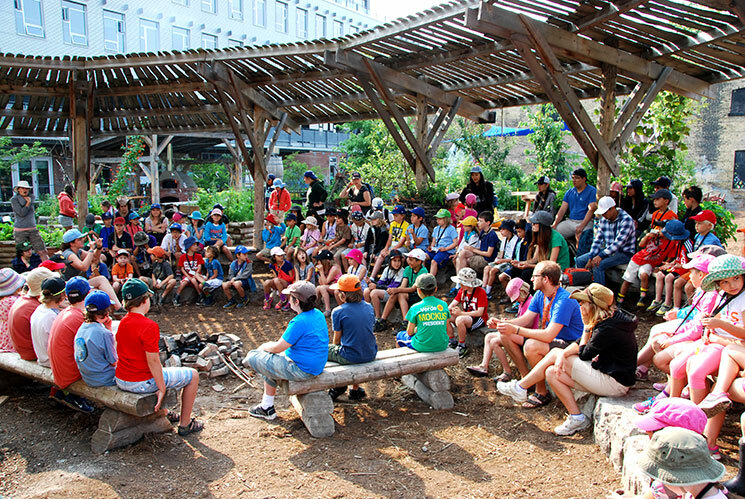 Evergreen Adventure Camp program offers one and two-week camp sessions where campers aged 6–15 will explore the greener side of Toronto through new discoveries and adventures in the urban wild. With more nature than any other city of its size in the world, Toronto offers children and youth an ideal environment in which to uncover the wilderness that lies beneath the urban landscape. We’ve seen how outdoor play activates the body and engages the mind, inviting Evergreen Adventure campers to develop a new relationship with the natural world and inspiring a new generation of environmental stewards in the process. For more information on our mountain biking summer camp, please visit Bike Ventures Camp. Camp runs from July 2 to August 30, 2019. For detailed information on session dates, please download the Session Breakdown & Costs (PDF, 196kb). *Please note, camp does not run on statutory holidays such as Canada Day and the August Civic Holiday. Drop off is from 8:30-9:00am, pick up is at 3:30pm. All our 2019 camp sessions are now fully registered with waitlists. To inquire about waitlist lengths, please feel free to call the office at 416-596-1495 x252. All session fees include catered lunch. No refunds will be issued if a reservation is cancelled within 21 days of the session start date. Otherwise, camp fees are refundable, less a $50 administration fee. Please note, registrations are non-transferable. A 15% discount available for all campers at the Gradale Academy, a private elementary school located at Evergreen Brick Works. For more information please contact Michelle Gradish at gradale@bell.net. Evergreen offers a free parking window in all lots from 8:30-9:00am and 3:30-5:30pm every weekday during camp. If you are parking outside those hours, you must pay at the meter. Can my camper be in the same group as their friend? Building a fun, friendly and accepting group of campers is a key goal for Evergreen Adventure Camp, and we encourage all campers to build new friendships. To ensure this, we accept friend requests only if the campers are in the same grade program and session, and we limit the requests to one per camper. Friend requests that are not in the same grade and session group will not be considered. We are unable to guarantee friend requests. We’re outside as much as possible! We love the outdoors at camp and spend as much time outside as we can. That being said, we do have access to indoor space at all times and can spend some time inside in extreme weather, such as thunder, lightning, hail, extreme heat. My camper is too old for your camp. What other opportunities are there at camp for them? We have a Leaders-in-Training program designed for ages 12-15. As well, we are always looking for volunteers to support our camp program! Please contact our camp office if you’re interested in volunteering. For more information, please contact us at camp@evergreen.ca or 416-596-1495 x252.